You’ll go fast. You’ll scream. You’ll get wet. You’ll feel the adrenaline pumping. It’s Jet Boating. 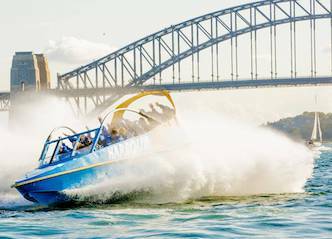 While you’re doing 360 degree spins across the iconic Sydney Harbour, you’ll not only be having an absolute blast, you’ll also be ticking some major tourist destinations off your must-see bucket list. Now that’s a ride you won’t forget. While you’re in Sydney we are promising you a longer ride, more spins and more excitement than ever before. Our Jet Boating experience will fling you around the internationally renowned Sydney Harbour and leave you clinging on for dear life. You’ll fly past the Opera House, Harbour Bridge and Luna Park, to the soundtrack of your Buck’s high-school-girl squeal. At the end you’ll be so wet and breathless, you’ll be screaming for more. Get in touch with our specialist party planners today for a suitable bucks activity package. Sydney Jet Boats may feel like you’re holding on for your life, but they meet international safety standards. These boats are the safest, strongest hull design, most comfortable, most thrilling and most fuel efficient operating engines available. You’ll be given a waterproof jacket to wear. You may not feel like you’re ready to hit a French cat walk, but it means you can get as wet as your heart desires, without copping strange looks at your fancy dinner afterwards. Who doesn’t love getting their adrenaline flowing? There are multiple boats available. Whether you’ve just invited you’re nearest and dearest or your whole home town is tagging along, there is room for everyone to join in on the fun. 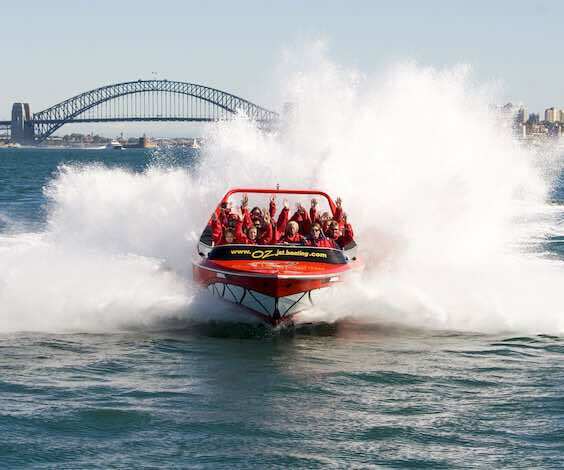 Sydney Jet Boats are located right in the heart of Sydney’s Darling Harbour, so it’s only a hop, skip and a jump to a range of bars and restaurants to celebrate your thrilling experience. Russell Crowe, Iggy Azalea, Rebel Wilson, and Toni Collette have all called Sydney home. With 1750 square kilometres of bush, beach and city to explore, it’s no wonder these celebrities are drawn to the East Coast hub. However, Australia’s biggest city doesn’t only accommodate for Hollywood’s rich and famous. The gramworthy beaches, cheeky nightlife and restaurants galore, your biggest struggle will be finding enough time to fit all the activities in. You don’t need to stress about the logistics, Wicked Bucks has done the hard yards so that you can kick back, relax and celebrate your final days of freedom. Sydney Luxury Boat Cruise Day: Don your sailor’s cap and bust out your leather loafers because there’s a boat party – Ahoy! This cruise is nothing like the tinny you and the boys take out on the river. Your trip around Sydney on a luxury cruise boat will have you feeling as though you’re voyaging to Monaco or St Tropez a la the likes of Gatsby. Sydney Barefoot Bowls and BBQ: It’s no secret that lawn bowls is making a big comeback and people are stripping off (their shoes) all around the country to get in on the action. So grab your mates, get on the shandys (hold the lemonade) and get ready for the ultimate afternoon ball action. Sydney Party Bus: As Australia’s biggest city, Sydney can sometimes be a stickler for traffic, but that doesn’t mean driving has to be dead time. Roll from A to B in style on a Party Bus and enjoy some extra special onboard entertainment. By the end of the night, the wheels won’t be the only thing going around and around on this bus.